Are you tired of rings on your coffee or end tables? Have you been meaning to get a coaster set, but have yet to come across one you like? The perfect solution is to crochet your own. A set of six can be completed in less than two hours for even the most novice of crochet artists. Chain 4; join with slip stitch to form a ring. Round 1: Ch 3; 9 dc in ring; join with a sl st in top of ch 3. Round 3: Ch 3; 1 dc in same st; *1 dc in next st, 2 dc in next 2 sts* Repeat from * 5 times; 1 dc in next 2 sts; join with sl st in top of ch 3. Round 4: Ch 3; *2 dc in next st; 1 dc in next st* Repeat from * 15 more times; 2 dc in next st; join with sl st to top of chain 3. Fasten off; work in loose ends. This pattern is one which can be easily adapted to your color scheme. Make different sets for special occasions. Reds and greens work well for Christmas, pastels for Easter and bright colors for birthday celebrations. For the more adventurous crochet artist, each ring could be a different color, or the outer ring could be different from the rest. 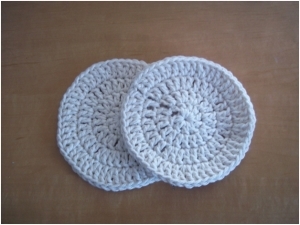 These coasters are made from the cotton yarn as it makes a durable, washable project.